The east side's new Latino marketplace debuts with 7,000 square feet of authentic street food and south-of-the-border shopping. 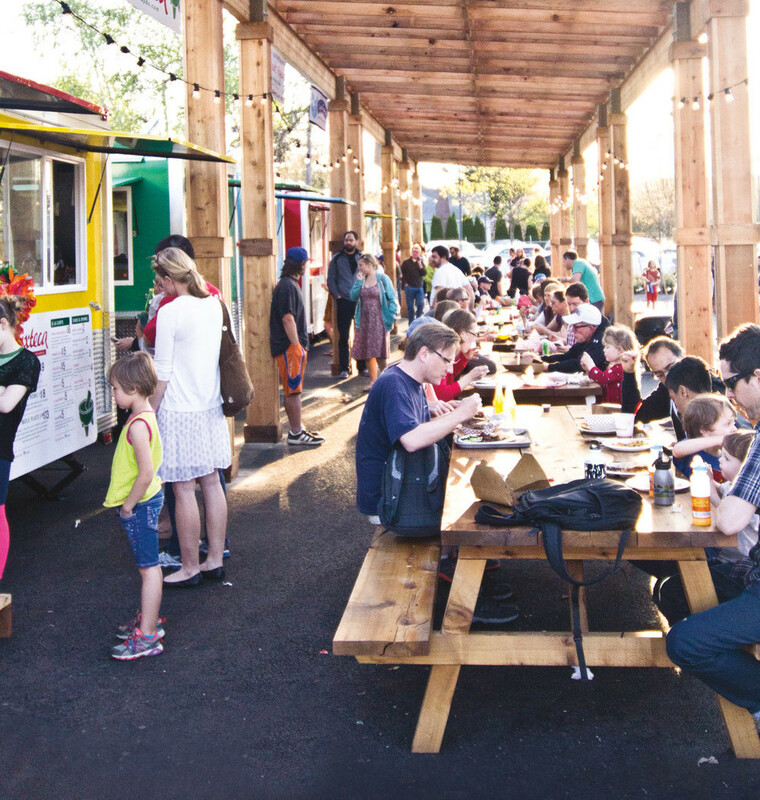 1 The Mercado’s outdoor area features an eight-cart lineup of Latin American flavor. Two newcomers worth watching: 5 Volcanes, an El Salvadoran cart that doles out that country’s signature chewy, cheesy pupusas with goodies like fried pork rinds and loroco (edible flowers) tucked inside; and El Gato Tuerto, an Argentine-Cuban cart with a standout Cubano grilled with ham, roasted pork, mustard, and pickles. 2 El Carnicero, an outpost of Beaverton butcher shop Ponderosa Provisioners, offers cuts of meat from Northwest and other West Coast farms, including marinated carne and pollo asada for grilling. A few feet away, Don Felipe, a dedicated chorizo maker, stuffs some of the best green varieties in town, with spinach, pumpkin seeds, and serrano chiles. 3 Despite its small size, Kaah (Mayan for “neighborhood”) is brimming with finds from all over Latin America. Not only can you find fresh epazote (a pungent, traditional Mexican herb) and cactus (pre-cleaned and chopped), but you’ll also discover house-made salsas, like habanero-carrot and roasted guajillo, along with fresh-fried blue and white corn tortillas. 4 Sugar fiends discover new highs at Fiesta Tradicional, a Mexican candy shop and piñata factory. Stacked floor-to-ceiling with treats, this outpost of the original Gresham operation spills over with Mamut marshmallow wafers, sour lime powders, and tamarind-flavored Pelon Pelo Rico push-pop candies. If you’re serious about sweets, you can get a whole piñata’s worth—or even order a custom shape. 5 Café Revolución Coffee Shop, a satellite location of the downtown café, may be the only place in town (apart from the original) to find real Mexican coffee. Not to be confused with rum-spiked Spanish coffee, café de olla is brewed in traditional clay pots and steeped with cinnamon and sweet piloncillo (molasses). For something more substantial, try atole de nuez, a thick, sweet pre-Hispanic sipper of milk and pecans—with a slice of tequila-soaked tres leches cake on the side.